BARBAROSSA (1991) The 98 foot crab fishing vessel Barbarossa disappeared with all hands February 10, 1991 near Saint George Island in the Bering Sea. Early that morning, a brief message was broadcast over the marine radio that caught the attention of three boats in the crab fleet who were engaged in opilio crab fishing near the Pribilof Islands of the Bering Sea. “May-Day, we’re going over, we’re about 40 miles west of St. George Island, please hurry.” The name of the vessel in distress was not given. The message was relayed to the U.S. Coast Guard who immediately began a search for the identification of the source of the radio call. Aircraft and ships were deployed to the area where the distress call was heard southwest of Saint George Island. Working with the fleet on the crab grounds, the Coast Guard was able to determine that the Barbarossa was likely the source of the call. The conclusion was determined by a meticulous process of elimination. 30 knot winds and 14 foot seas with temperatures in the teens did not help initial efforts to locate the ship. No significant sign of the Barbarossa was ever found. Lost were captain George Brandenburg (39) of Kodiak, Dennis Olberding (38) of Kodiak, Brian McPherson of Kodiak, Tim Schmitt of Kodiak, Darryl Gross of Wrangell and Don Bright. According to the Coast Guard, the Barbarossa was equipped with a 10 person self deploying life raft, 6 Survival Suits with strobes and 3 Emergency Position Indicating Radio Beacons, at least one of which was self deploying. BARGE NO 18 (1958) Tank Barge No 18 stranded and became a total loss October 22, 1958 on Shemya Island. The barge was under tow by the tug Wando on her way to the Northwest Orient Airlines Base on Shemya. There was no loss of life. BARON (1977) The 139 ton 75 foot oil screw Baron stranded and was lost December 3, 1977 off of Cape Cheerful. Four men, three women and an infant were rescued by the patrol vessel Vigilant. The Bear was valued at $1,000 at the time of the accident and had a cargo of $300 worth of provisions. Some of the two ton cargo was salvaged but the vessel became a total loss. BELAIR (1994) The 91 foot crab fishing vessel Belair stranded and was lost February 1, 1994 at a seal rookery on the south side of Saint George Island. A helmsman sleeping at the wheel was the cause of the disaster. All six crewmembers escaped on a life raft to the beach where they were airlifted by a U S Coast Guard Helicopter from the Coast Guard cutter Rush to the fish processor Blue Wave moored nearby. The crew aboard the Belair was reported to include owner operator Lou Dochtermann of Kodiak, Bernie Maier of Kodiak, Robert Hunter of Kodiak, George Owner of Kodiak, Wade VanSant of Washington state and Joey Wolff of Washington state. Heavy seas broke up the Belair on the rocks and she became a total loss. BELLA (1879) It was 10:30 in the morning December 5, 1879 when the American schooner Bella missed stays in a westerly storm and stranded at the north entrance to Oumnak Island. The crew of 5 made it ashore but the Bella, valued at $4,000 broke up on the beach beyond repair. BETTLES (1966) The landing craft Bettles grounded and broke up in 65 mile an hour winds and rough seas November 8, 1966 off of Semisopochnoi Island in the Aleutian Islands. All crewmembers were rescued by the U S Coast Guard cutter Balsam. BETTY B (1991) The 37 foot fishing vessel Betty B hit a rock, capsized and was lost June 26, 1991 in Atka Pass near Atka Island. The vessel was fishing black cod when the disaster occurred. Lost were skipper Patrick Flanery (36) of Sitka and James Weber (36) of Kodiak. Todd Burns was the sole survivor. The same vessel had lost another crewman, Thor Plumlee, in a skiff accident off of Umnak Island in March. The same skipper had also lost another vessel, the Jessica B, on a reef in December of 1990. BIG VALLEY (2005) The 92 foot Opilio crab fishing vessel Big Valley sank January 15, 2005 approximately 78 miles west of Saint Paul Island in the Bering Sea. An EPIRB signal was picked up at the U S Coast Guard Station in Kodiak at 7:15 a.m. and search and rescue began immediately. Four hours later a life raft was found with one survivor; Cache Seel (30) of Kodiak. Subsequent searches and investigations revealed that the other five crewmen of the Big Valley were lost. They included owner and captain Gary Edwards (46) of Kodiak, Danny Vermeersch of Belgium, Josias Hernandez Luna (48) of Anchorage, Carlos Rivero (30) of Uraguay and Aaron Marrs (27) of Nashville TN. The U S Coast Guard attributed the disaster to a loss of stability caused by overloading. BIRGIT N (1987) The 123 foot crab fishing vessel Birgit N grounded and was destroyed March 8, 1987 in Patton Cove on Ulak Island in the Aleutians. 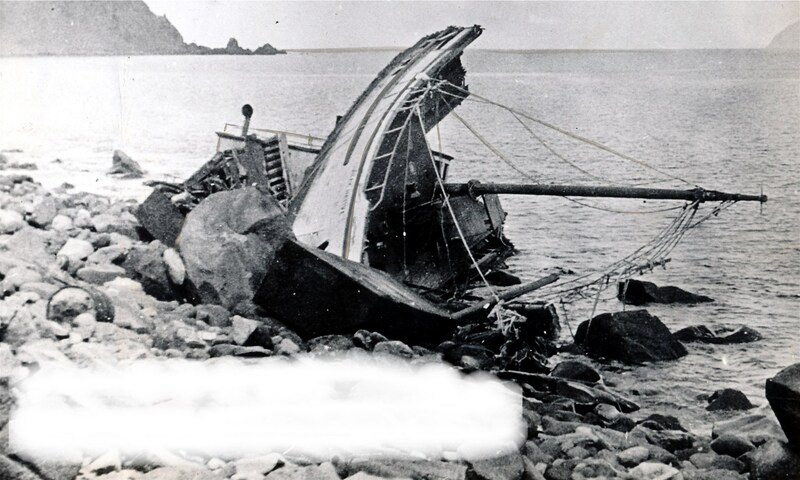 BOKSETEGORSK (1965) The Russian motor trawler Boksetegorsk foundered in a gale January 15, 1965 between Saint Matthew Island and the Pribilof Islands. All 14 crewmembers were lost. Three more Russian trawlers with approximately 14 crewmembers on each were lost five days later in the same area. They included the Nahichevan, Sebezh and Sevsk. BORNEO MARU (1942) The 5,863 ton Japanese cargo ship Borneo Maru was attacked by U S Army aircraft, stranded and was lost October 5, 1942 at the head of Gertrude Cove on Kiska Island.